The Canon EF 70-200mm f/2.8L IS USM III Lens improves on its predecessor, the Canon EF 70-200mm f/2.8L IS USM II Lens, with enhanced clarity thanks to Canon's Air Sphere Coating. This better suppresses flare for better contrast and improves overall sharpness on an already very sharp model. Featuring a fast and near-silent AF system, the Canon EF 70-200mm f/2.8L IS USM III Lens is optimized for wildlife and sports shooting. As with the Mark II version, Image Stabilization offers 2 Modes: Mode 1 compensates for shake in all directions and is designed for hand-held shooting. Mode 2 compensates for horizontal shake and is helpful only when shooting across the horizontal axis (i.e. panning). Shoot relatively close to your subject with this telephoto lens across all focal lengths for greater versatility in small spaces. You can also take advantage of the focus range limiter, which enables shorter focusing times on an already fast and near-silent AF system. This lens features a tight seal structure that is weather resistant and suitable for all outdoor shooting conditions. Seals are placed around the mount, all switches, and zoom and focusing rings. For this version, a special fluoride coating has been applied for even more protection against smudges. This fluorine coating helps prevent dust, water, oil and other surface residue like fingerprints from sticking to the lens. The Canon EF 70-200mm f/2.8L IS III can be paired with both full frame sensor cameras, such as the Canon 5D Mark IV, and with crop frame sensor cameras, such as the Canon 7D Mark II. The focal length equivalent on crop frame sensors is 112-320mm. Give yourself even more reach when you pair this lens with a 2X or a 1.4X Canon extender (rentable separately). This lens is ideal for sports and wildlife photography as well as portraiture and event shooting. Is this updated 70-200mm f/2.8L for me? The Canon EF 70-200mm f/2.8L IS USM II Lens remains a remarkably sharp and agile telephoto zoom with little need for optical improvements. However, flare and ghosting were known issues for heavily-backlit subjects. Sometimes, these effects are artistically preferred. Other times they are not. The coatings of the Mark II were examined and an updated version has been applied to the Mark III. This makes a noticeable difference in contrast and perceived sharpness for shooters who encounter a lot of backlighting (common in portraits but also in some wildlife and sports situations). An advanced Air Sphere Coating has been added while the glass specifically has not changed. The already-superb optical design is benefited by new fluoride coatings to resist any possible moisture buildup, while suppressing dust and smudging. Image Stabilization is identical to the Canon EF 70-200mm f/2.8L IS USM II Lens. There are a few aesthetic changes. The barrel color is a truer white (as opposed to the slight off-white of earlier versions). Printed elements on the lens are also slightly enhanced. This version is ideal for those who shoot in very bright environments and is a great option for outdoor portrait photographers, field sports photographers, those combating flare from stadium lighting, and wildlife photographers – particularly those capturing birds in flight and on water. 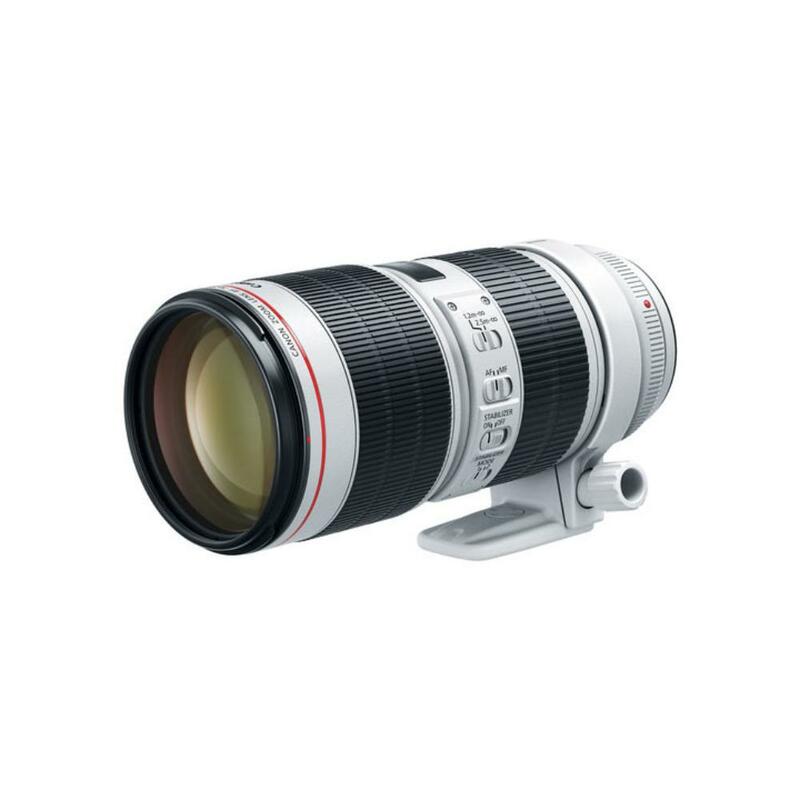 For the latest version of the f/4 edition of this lens, please see the Canon EF 70-200mm f/4L IS II USM Lens.